"I work in the commercial card product group for Bank of America. I’m also the co-chair of LEAD for Women which is one of the bank’s employee network groups. Today I attended Sheryl Kline’s Mental Toughness for Women seminar... I learned to focus on the goals that I want to achieve and how I need to move them forward. Thanks Sheryl!" "Sheryl was a panelist for a recent event in our Female Founder Happy Hour Series that we hosted with Autodesk. The topic was 'Building Mental Toughness' and Sheryl's content was practical and engaging. Attendees were engaged and left with clear take-aways on how to be more mentally tough, especially in high pressure situations. Sheryl was inspiring and effective, and we can't wait to work with her again!" "I've gotten tremendous support and help working with Sheryl through the 1:1 coaching, training, worksheets and other tools. And now with all the planning that we've put together in place, I am SO excited to go after and chase my dream. I highly recommend working with Sheryl for anyone looking to chase their next career dream and goals!" "My old habits of working all night, or my old habits of being hyper-available weren’t serving me. So I think having clarity and more skills around Mental Toughness to be able to discern where my responsibilities started and stopped [at my job] and where the client’s responsibilities were that would have empowered me to NOT slip into old behaviors. For me that was getting into over-eating again and getting into over-working again … those things that I did a lot of work to keep at bay … I slipped back into it and I think it was because I was lacking some of the Mental Toughness skills and I was taking on board more than was fair. Being Mentally Tough has given me much more control over my life, and I've never been happier!" "I was at a place where I was doing well, but I knew I was limiting myself. I couldn't quite get over what it was exactly that was holding me back. So, I had Sheryl really help me to get some huge breakthroughs … not just in my business, but in my life, and really understand those things, and those little tiny habits, little tiny thoughts that we're consuming me to really get over that hump and help me get to that next level. I cannot recommend her enough for High Performance coaching. She was so helpful. Really opened my eyes to so many things… so many stories I've been telling myself that just simply weren't true. 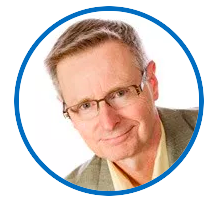 It was a really great experience to help me get those breakthroughs… not just in my business, but in my life and help me get to that next level." 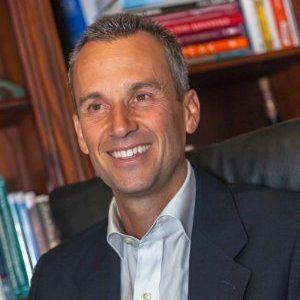 I highly recommend Sheryl to anyone who is looking to “step up their game” and become a high performer in whatever they do, whether career, family, school, athletics or otherwise. Sheryl has also had great success in working with my wife, and helped her achieve many breakthroughs, as has also been the case for me. We are grateful to have Sheryl in our lives and enthusiastically endorse her as a World-Class Coach!" 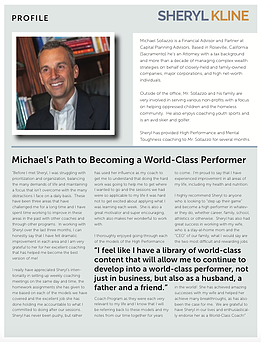 "I contacted Sheryl Kline when I was feeling lack of focus and sense of achievement with my day to day life. Coincidentally, my daughter was taking her Mental Toughness online course as part of participating in the club volleyball team. While listening to some of the video lectures, it dawned on me that adults could use the skills she was teaching teens. Sheryl has helped me clarify priority for my life, and not just what is important to me, but WHY it is important to me. This has helped focus my energy to what matters most to me, and as a result I feel more in control. I have also regained the sense of calm even when I am overwhelmed with the amount of juggling I deal with personally and professionally. 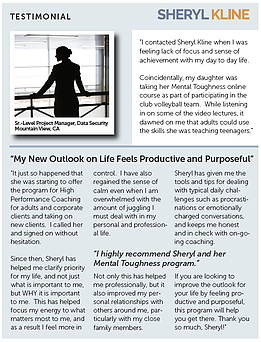 I highly recommend Sheryl and her Mental Toughness program – if you are looking to improve the outlook for your life by feeling productive and purposeful, this program will help you get there."